What Sudrania writes against me reminds of the metaphor ‘Like a blind man in a dark room looking for a black cat that isn’t there!’ He has NO evidence to present to clear Sai Baba of any of the charges of sexual abuses, or connivance to cover-up the murders in his rooms, while there is much documented indicating this easily found on the Internet from most reputable newspapers abroad – and a few in India too! Sathya Sai Baba repeated endlessly that he is the omnipresent, omniscient, omnipotent God, Saviour of mankind – as well as the Deity of Deities at whose feet every prayer addressed to any deity will eventually come! Dr. Prakash sees nothing excessive in that, he calls Sai Baba a ´great saint´and figuratively grovels at the thought of him, spouting the aphorisms Sai Baba gave (with Professor Kasturi as writer/editor as SB´s English was almost non-existant at the time). 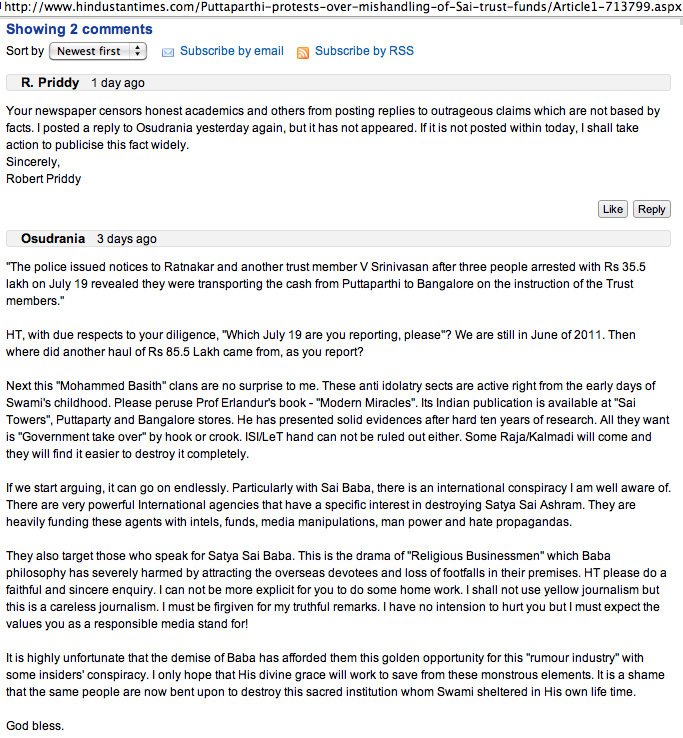 This entry was posted on June 29, 2011 at 12:12 pm	and is filed under Cults, Gurus, Sathya Sai Baba. 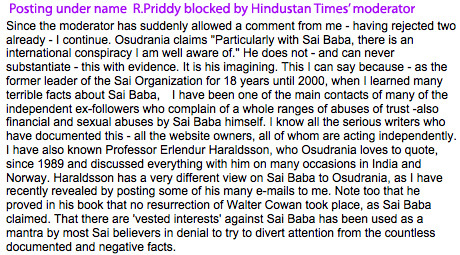 Tagged: Dr. Om Prakash Sudrania, Hindustan Times, Osudrania, Professor Erlendur Haraldsson. You can follow any responses to this entry through the RSS 2.0 feed. You can skip to the end and leave a response. Pinging is currently not allowed.